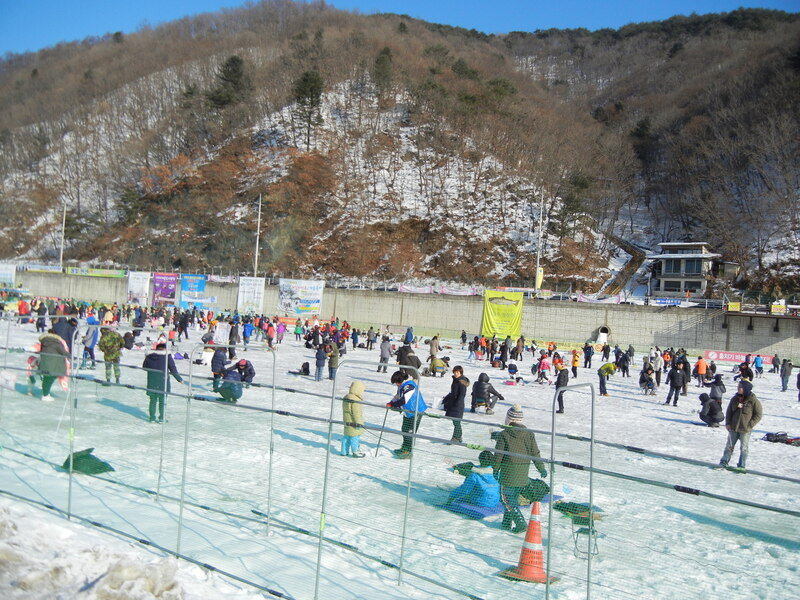 From Busan (or anywhere, I think) you will need to take a bus to Chuncheon and then to Hwacheon. 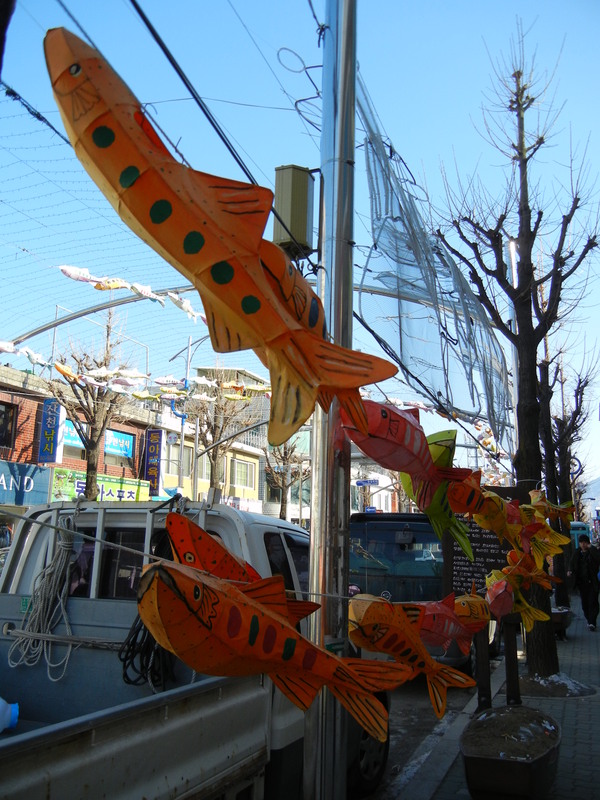 From Busan it is about 5 hours and then to Hwacheon it is about 30 minutes. 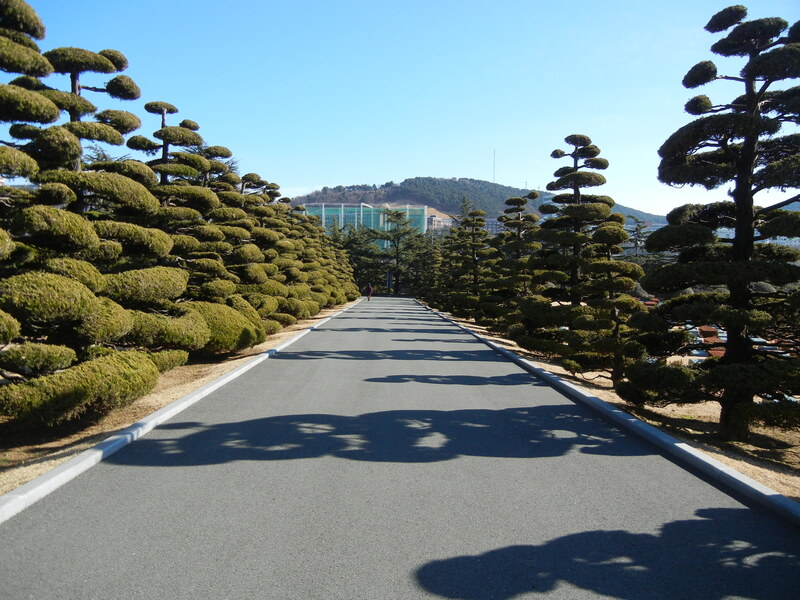 I think from Seoul it is about an hour to Chuncheon. Anyway, coming from Busan you can’t leave past 8pm. My friend and I tried going straight after work, getting to Nopo bus station at 840 with no luck. They said the first bus was at 730am and when we got there at 715 the next morning they were sold out until 840. We could have bought the 730 tickets the night before, but whenever I have bought bus or train tickets early I don’t wake up. And when I don’t buy the tickets in advance I wake up and the first bus is sold out. Oh well…thus is life in Korea where you can’t buy tickets online. And can’t buy them if you’re not in the city you’re buying from. 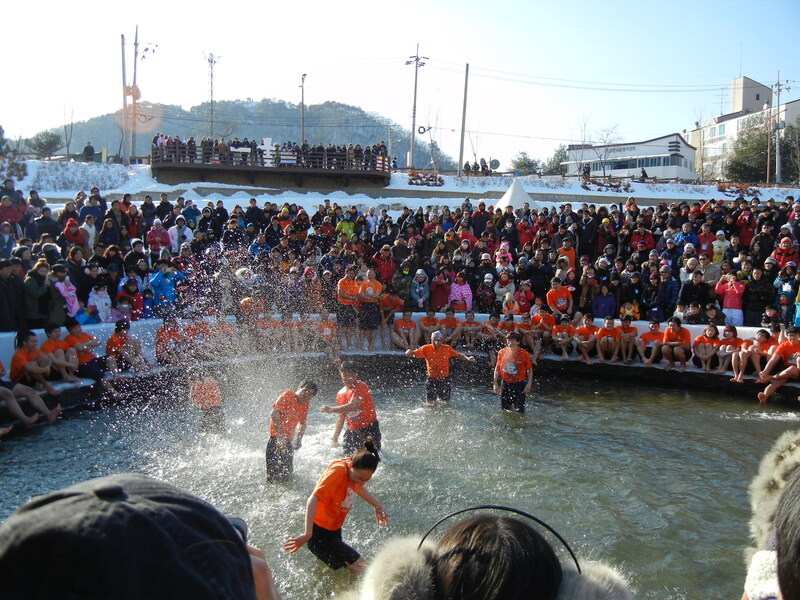 Hwacheon is a pretty small city, but throws a few festivals throughout the year, including one where you though tomatoes (I plan on coming back for that…). I’m pretty sure we walked around the whole city going along the river, so it can’t be that big. It does have Popeyes. Which I haven’t seen in Korea anywhere else. We got there about 2pm on Saturday and left around noon on Sunday. 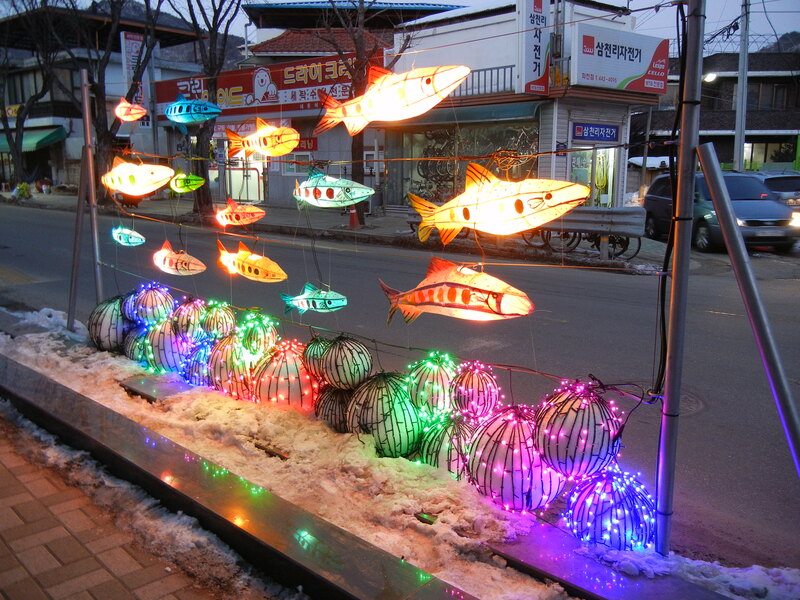 There are fish decorations all down the main street (N-S) and part way down another main street (E-W). There is also a giant bear to great you as you enter the city, but he has his back to the bus station so I couldn’t get a great picture of him. 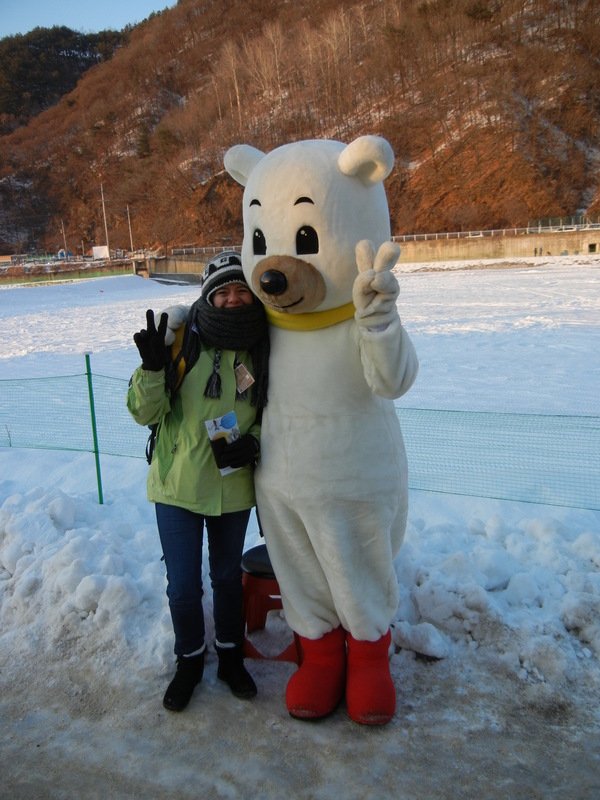 However he is the mascot for the town so he is pretty much everywhere. There were about 10,000 people fishing, would be my guess. We went back Sunday morning there was no one there. 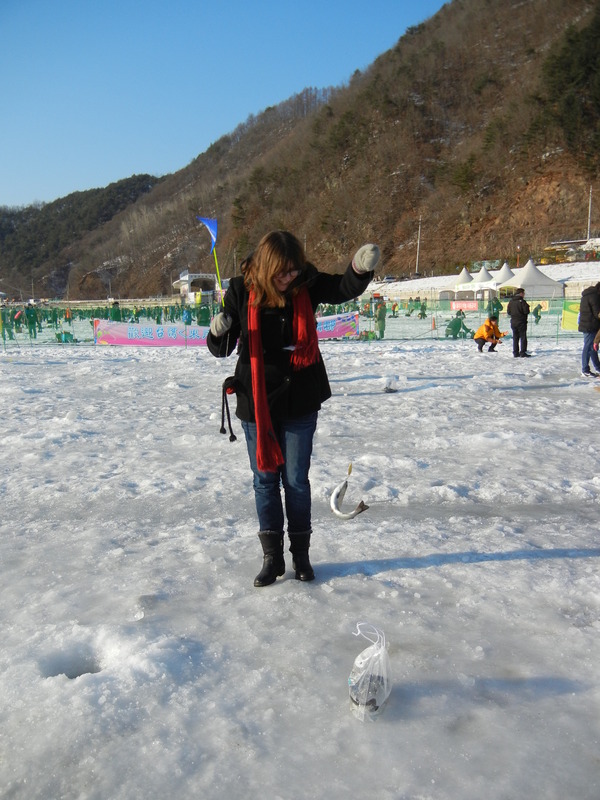 You can try to catch a fish with your bare hands, but that seemed a bit too cold for us. 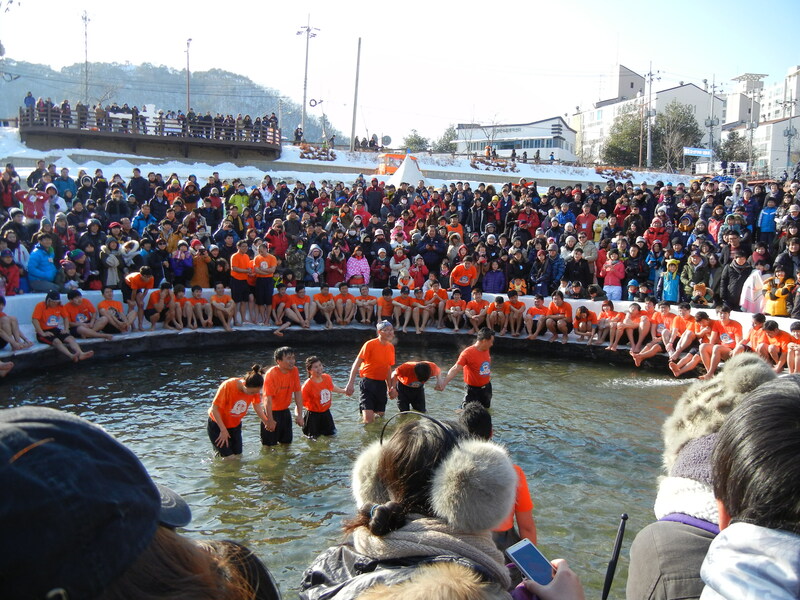 My hands were almost frozen just from walking around with gloves on (I always forget to move my fingers) so the idea of catching them wearing shorts and a T-shirt in cold water was not a fun idea. 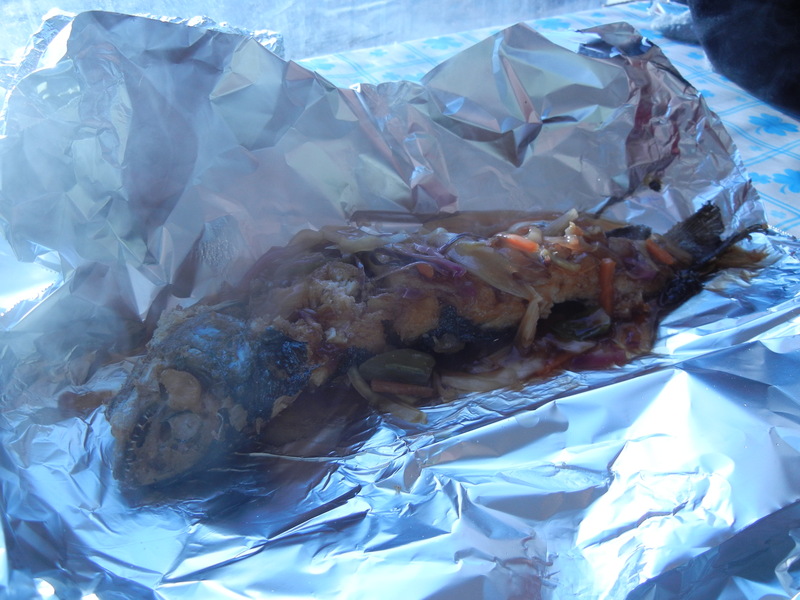 Most people but the fish in their shirts and pulled them out with their mouths. That’s too much. 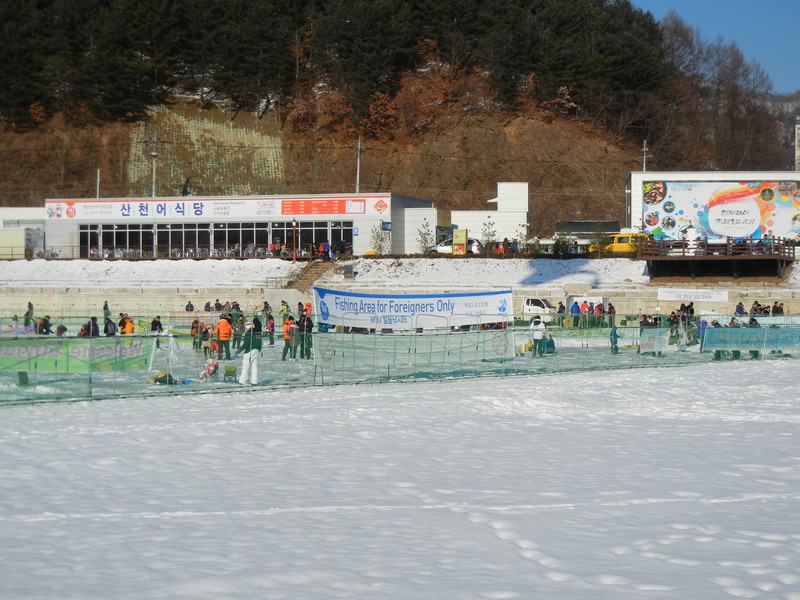 Then we found our foreigner only fishing area which did have Koreans in it! The staff there were super helpful and you can borrow the fishing rod from the foreigner only tent (which had Koreans blocking it the second time we tried to go in…I guess when they were told they could not go in they stood outside and tried to not let anyone in–that doesn’t work for me!) 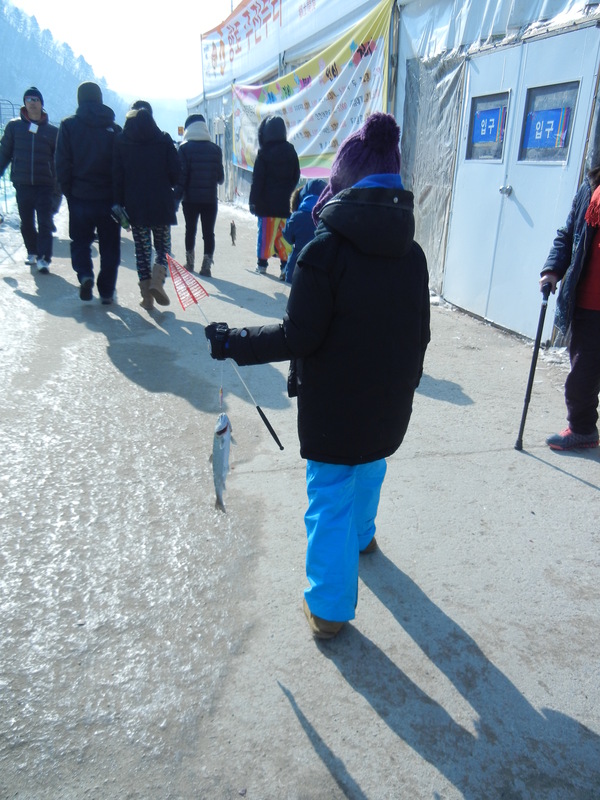 The staff will get the fish off your hook, put it in your bag, and put water in your bag too so the fish won’t die. I didn’t catch any, but my friend caught two. 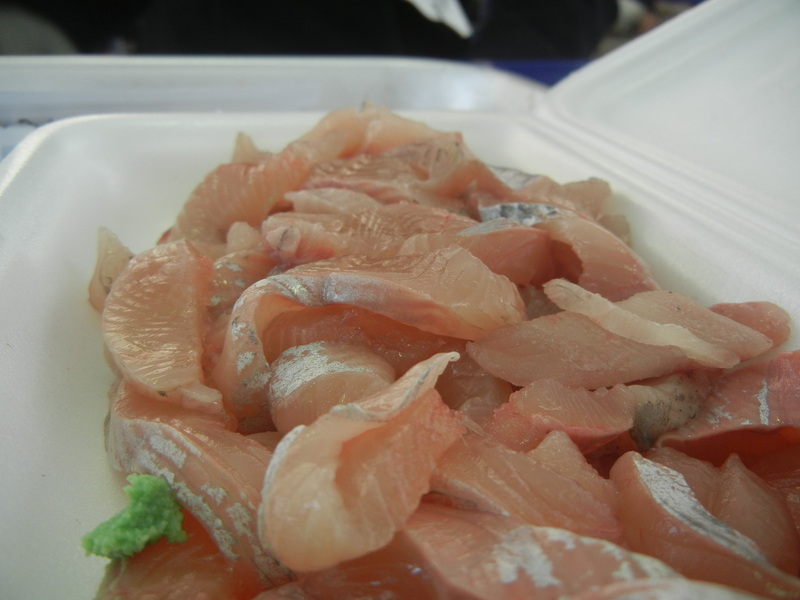 We tried the fish both ways they were offered–grilled and fried. 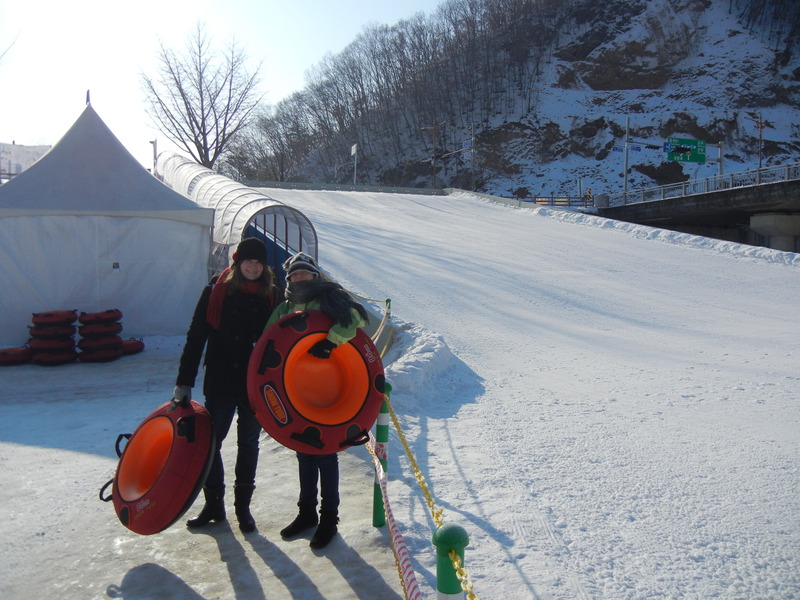 After that we headed to the kiddie area, called Snow Fun Park. 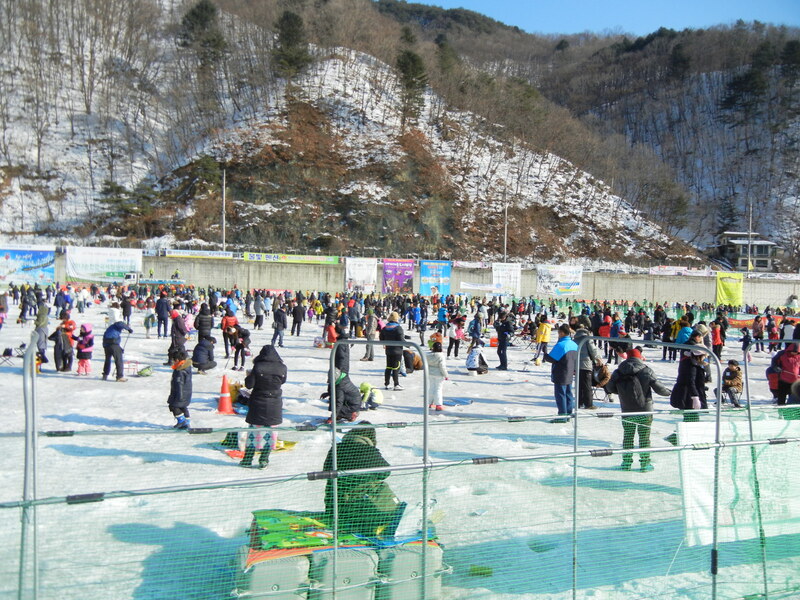 They had a Snowmen Zone, Snow Snake Eolgomi Sled and Sledge Park. 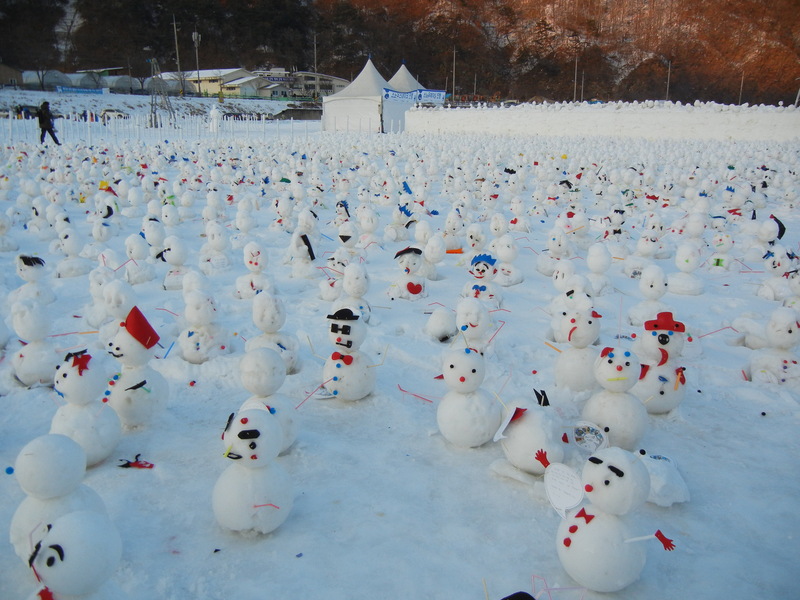 The Snowmen Zone made me think of that photo that was going around awhile ago with the caption ‘snowmen gather to protest global warming’. They were all made by kids and parents. 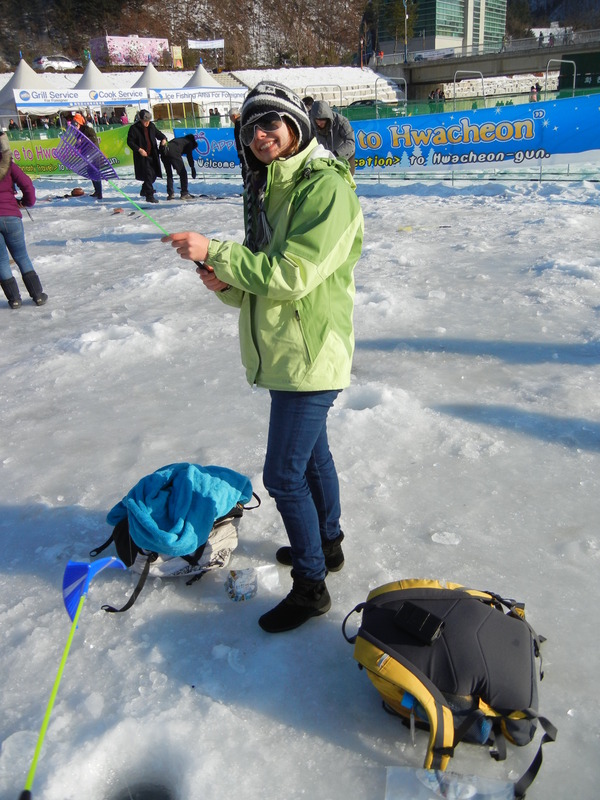 The Snow Snake Eolgomi Sled was interesting….it is two kayaks tied together which are tied in the front to a cable that goes back and forth and you do an oval around it. At one point we flew out of the oval track because we did not weigh enough and my kayak got pushed back in but my friends did not and she had to wait till we were going fast enough to go back in! She was basically vertical until she went back it. It was tons of fun! I screamed and laughed the whole time. 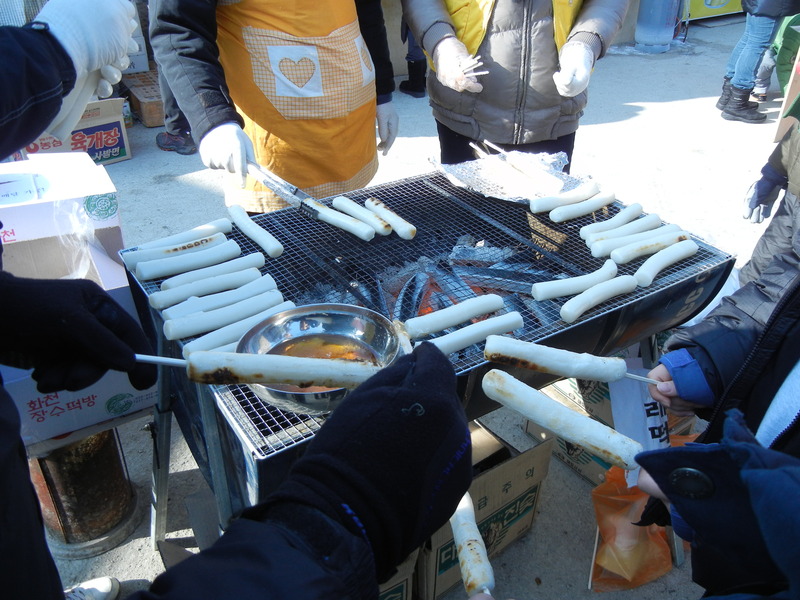 After we tried the sweet food they had: grilled rice cake on a stick with honey. Pretty good, but still not as sweet as my American taste-buds would like. I liked it more than I though I would have though. There is a World Winter Cities Plaza which probably would have been better during the day, but we ended up there at dusk. The 3D art area was really small so we did not want to pay 5,000 entry. There was also a 4D ride which had a huge line filled with children, so I guess it was more for them. The Tea Event is what we really went to this Plaza for, but if there was tea to be given out it was no longer there at 6pm. There were outfits from different countries you could try on and pose with though–we did not because, well, what does that have to do with tea? 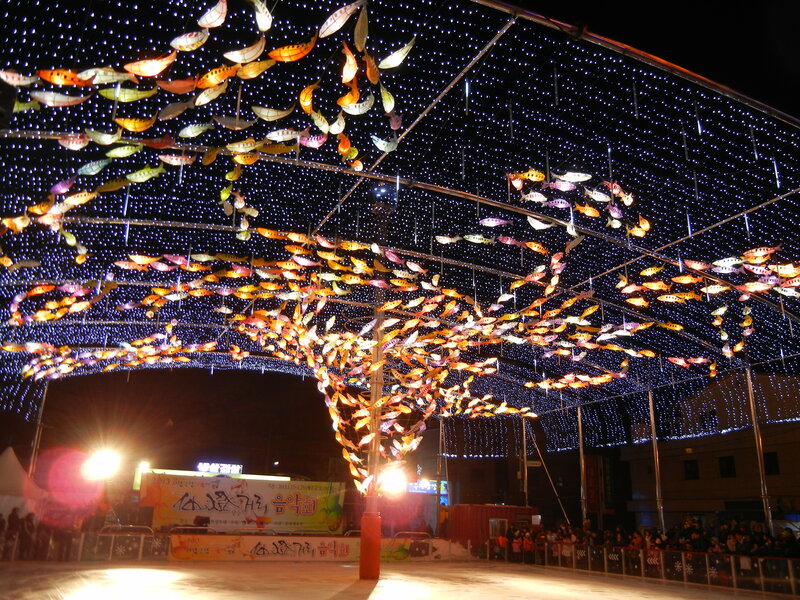 We then walked to Hope Lights Plaza which is a tower with an ice skating rink next to it. There were some people preforming at first, and later anyone was allowed on. 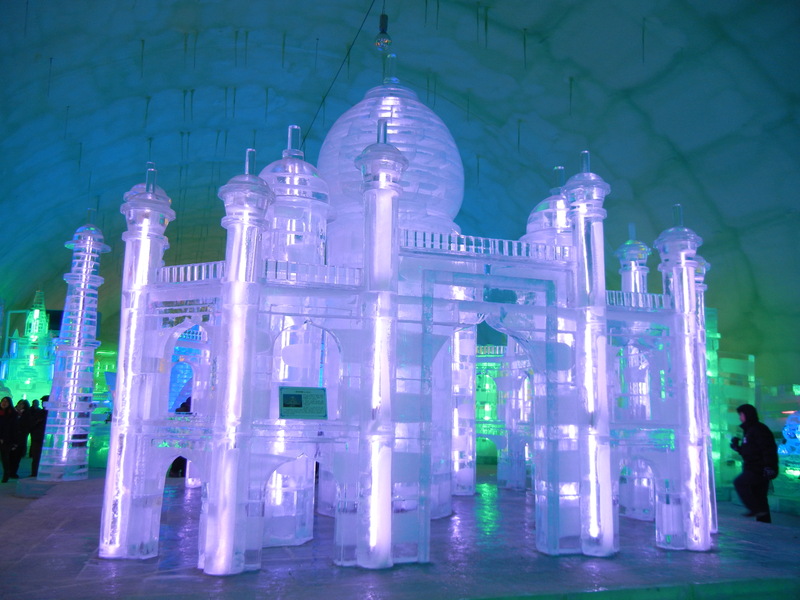 The Ice Illumination Plaza is where the ice sculpture were and they were huge! 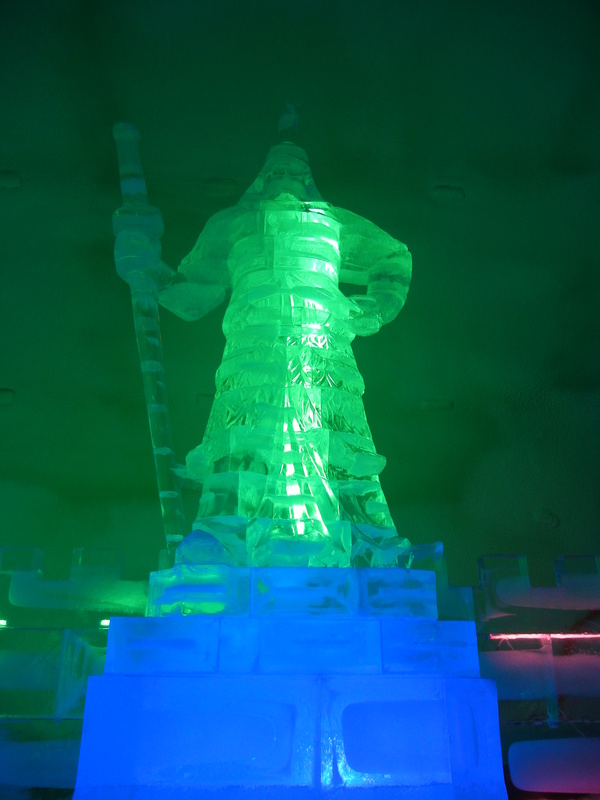 I’ve seen ice sculpture before but never this big! 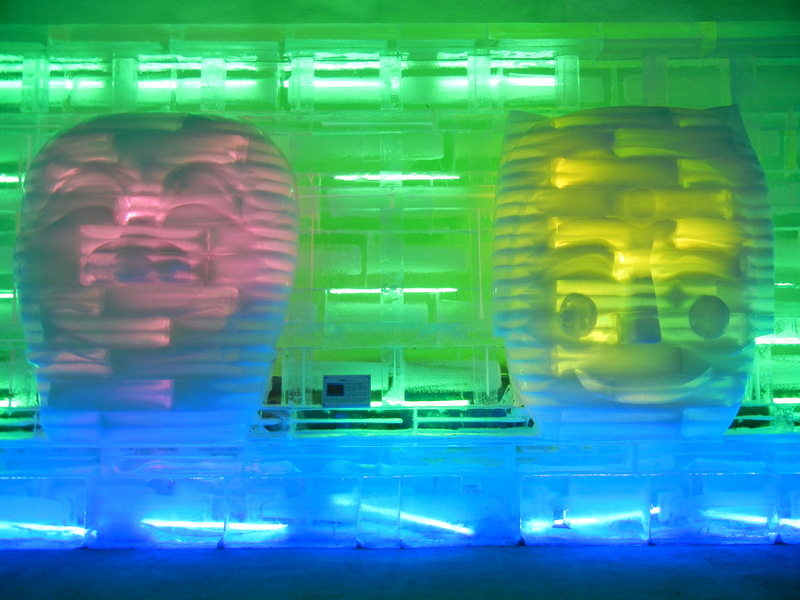 The was a Zodiac calendar, Terracotta Warriors, Andong Masks, statues and palaces from Seoul, the Taj Mahal, an Igloo, a dragon chair, the Sydney Opera house and so much more. 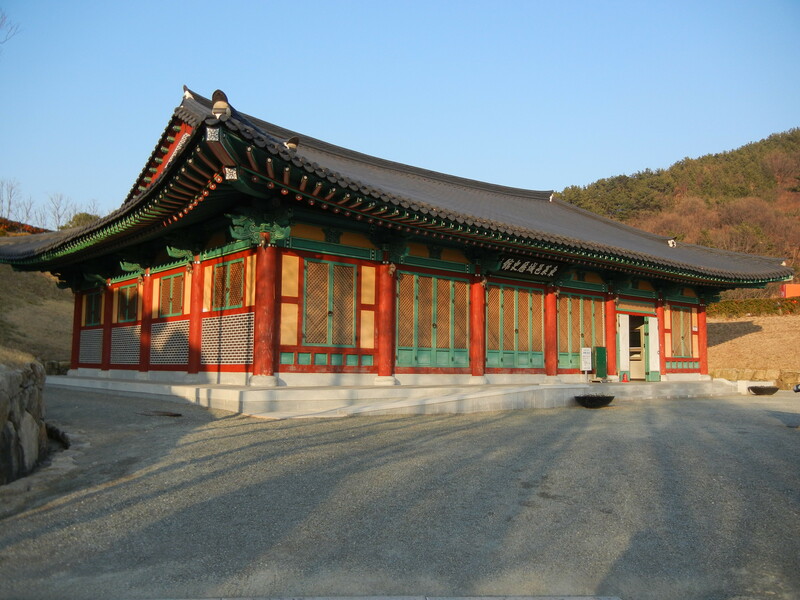 Getting off at Dongnae or Myeongnyun you head East and go along a road with apartments to your left. I wasn’t sure what I was looking for since I couldn’t find anything online about it, as with many things in Korea. I saw this hill to the right and decided to go up. 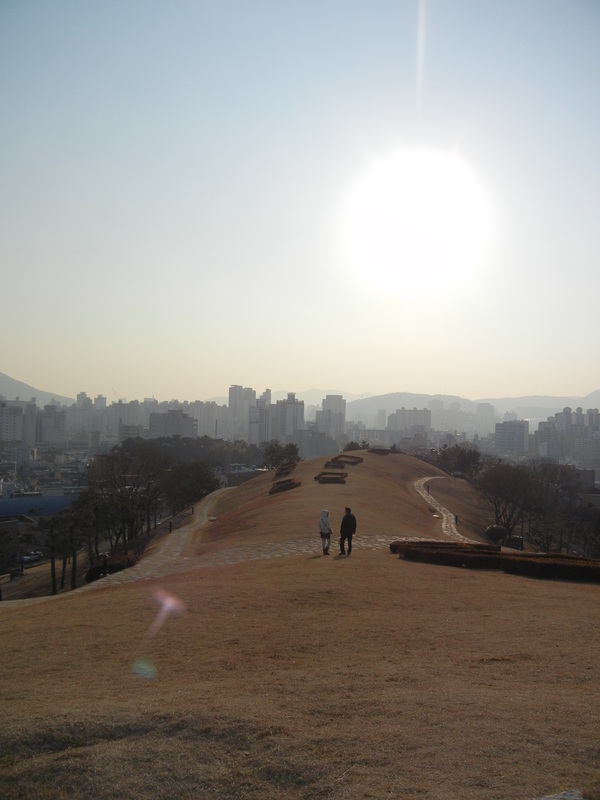 It had a great view of Busan. 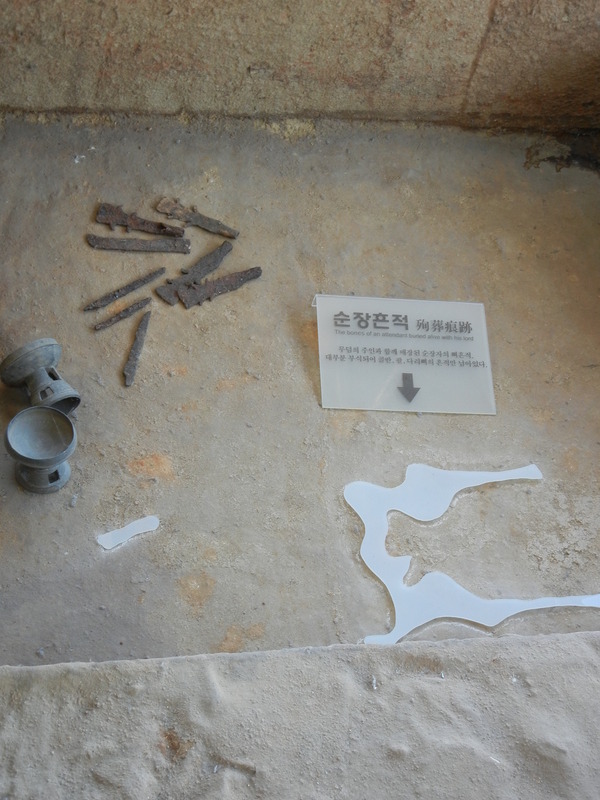 The Bokcheong-dong No 53, burial dated to middle 5th century AD, is large pit-style grave composed of the main, a later stone chamber type, and the accessory burial, a earlier wood chamber type. 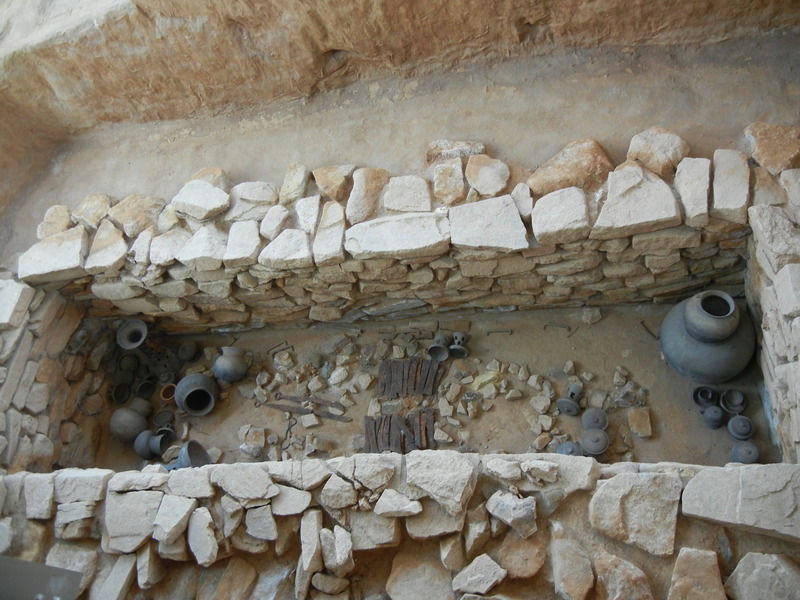 Because it was excavated without any disturbance, the No 53 burial showed its complete features with the undisturbed disposition of a large quantity of grave goods. 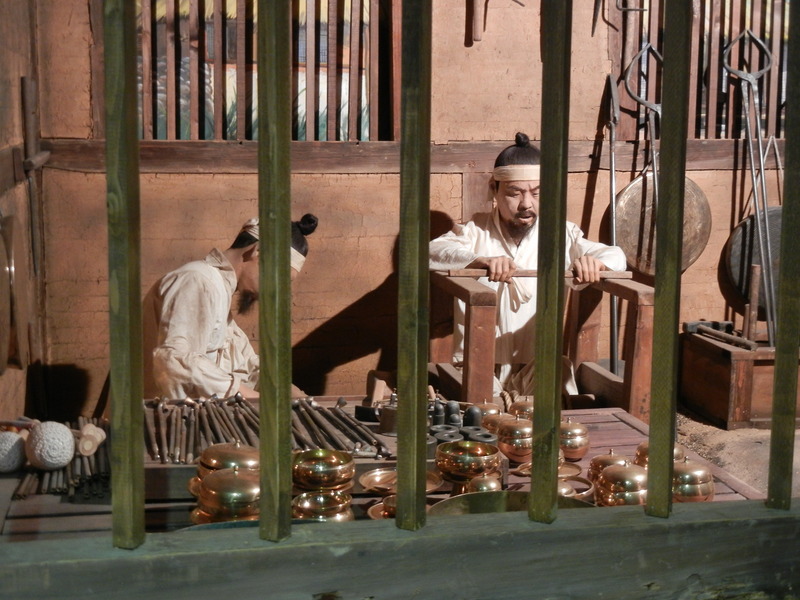 among the wealthy burial goods including ceramic vessels, iron tools and weapons, precious metal earrings and glace beads, the greater part of them is the various types of pottery. 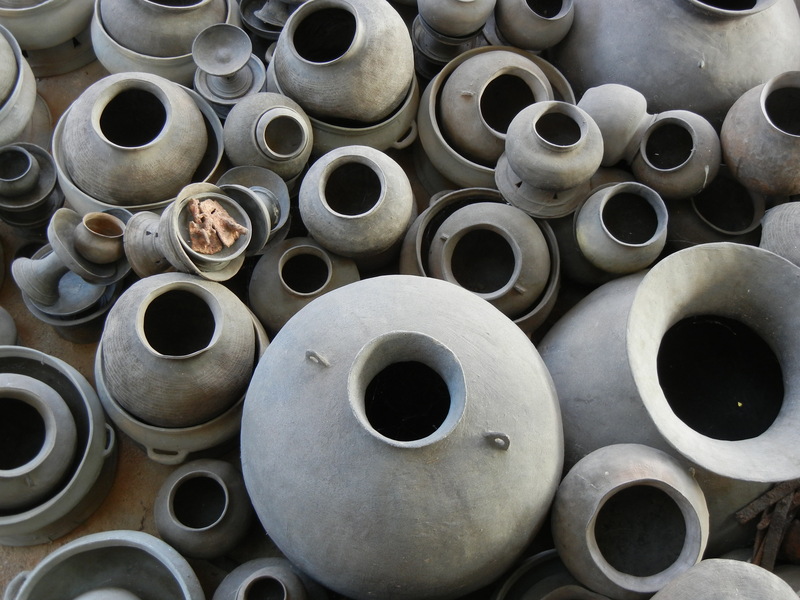 the ceramic vessels have, for the most part, relatively simple designs, but some of them are richly decorated or manufactured copying certain objects, such as shoes or lamp. the main body buried with some attendants was suggested to be female from the observation of the grave good association with showed almost no emphasis on the burial of arms and armor. a bulky disposition of pottery imported form Human, the center of Ara-Gaya, makes archaeologists assume that the woman buried in the No 53 grave would be from it. I can’t wait to go back and do a super easy ‘hike’ to see the rest. Last night, I got into a cab and said for him to take me home. He took me to the police station. They took my wallet and gave it back without my ARC (alien residency card). Then, they yelled at me for not having my ARC. After 30-45 minutes, they said sorry and gave it back, because it fell on their floor behind the desk. Then they paid for the rest of my cab home. The cab driver could have just been taking advantage of me because I had been drinking–but then why take me to the police? Or…the driver thought I would not pay him (not sure why, other than the ATMS would have been not working) so he took me to the police? That one kind of makes sense too, because he kept talking about money. I did have enough though, he could have told me the amount and I would have paid him…but we were not at my place so why do that? I just have to hope that my phone is at the bar, then the first story would more likely be correct. On subways I get stared at and laughed at. 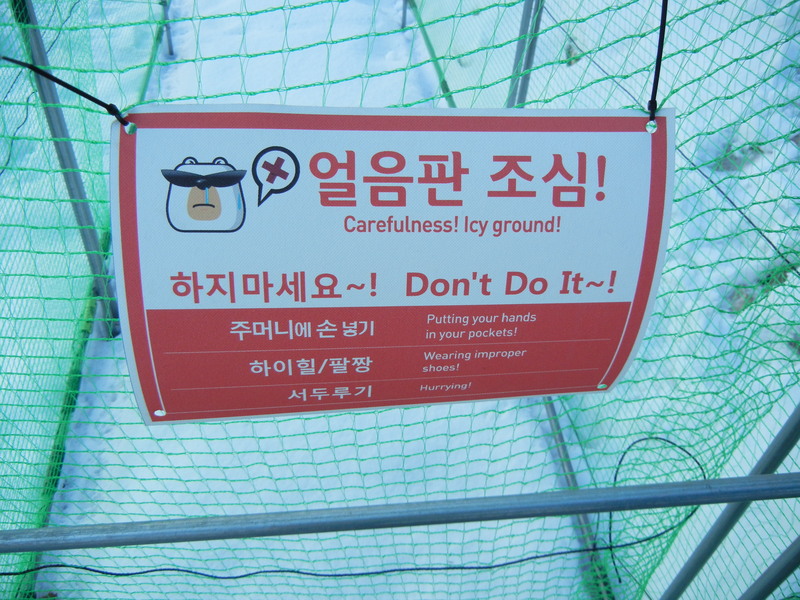 In taxis they yell at me whenever I say I want to go to dongdaesin like they don’t understand that I live here. Maybe I’ll walk everywhere. And never drink again (other than plans that already involve drinking). The plans (and overall design) are really beautiful. 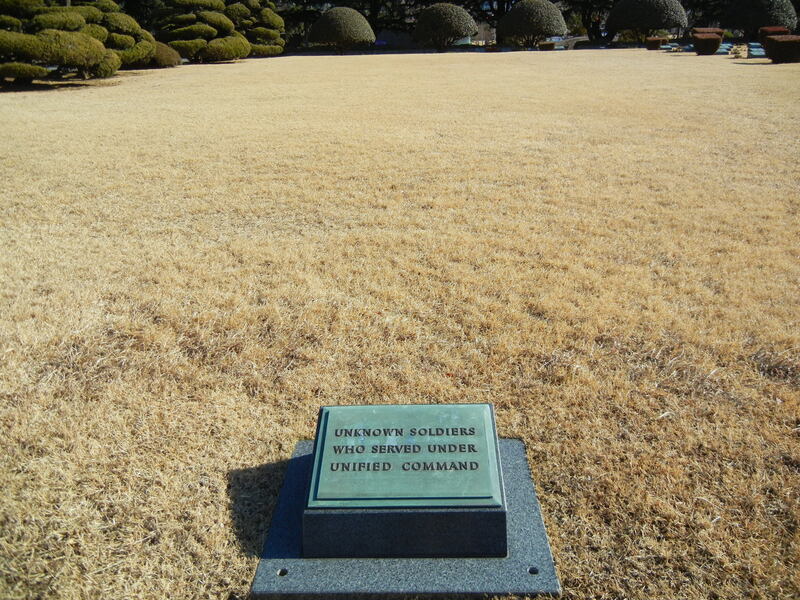 The part that I always find most moving of any war cemetery is the part for the unknown soldiers. 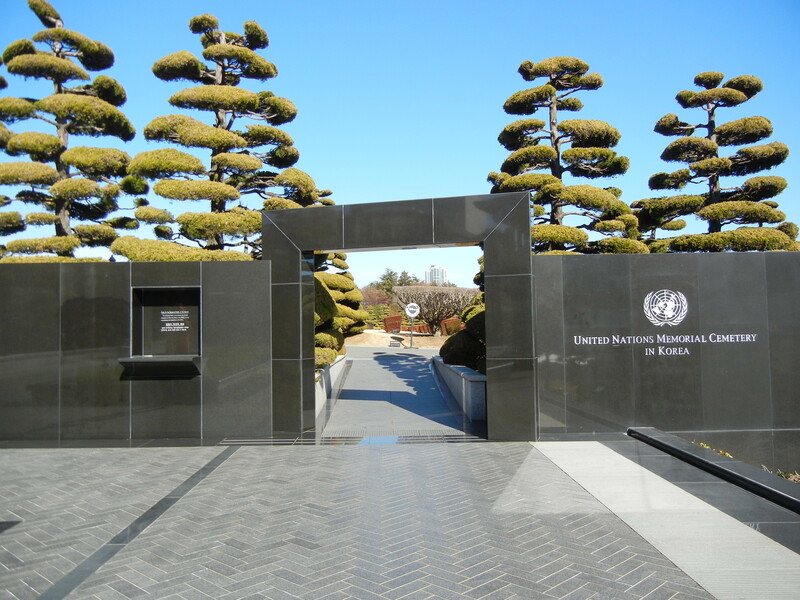 There are two parts for them in the UN Memorial Cemetery. 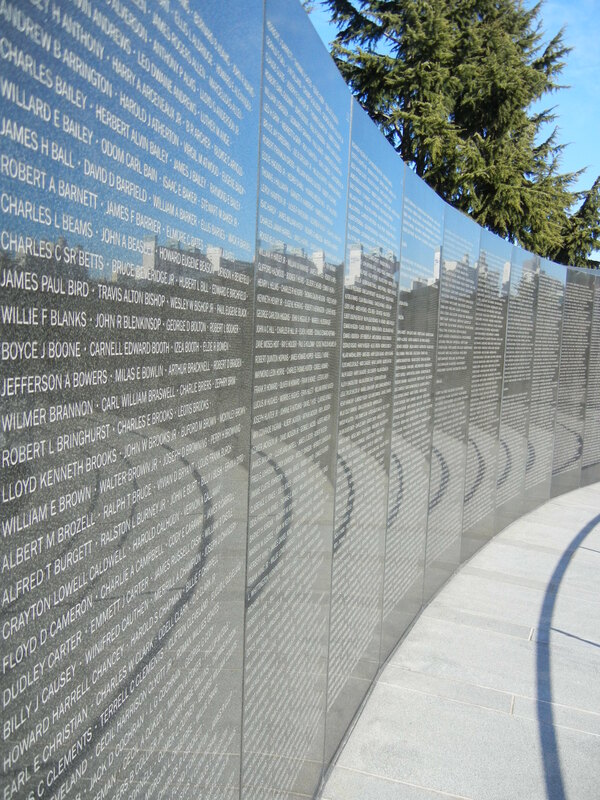 The Wall of Remembrance is filled with names, and the largest part is for America. This is just the start of it. In the reflection you can see the pool-like area that has a helmet in the middle and a flower at the edge (allegedly, I did not really see either). 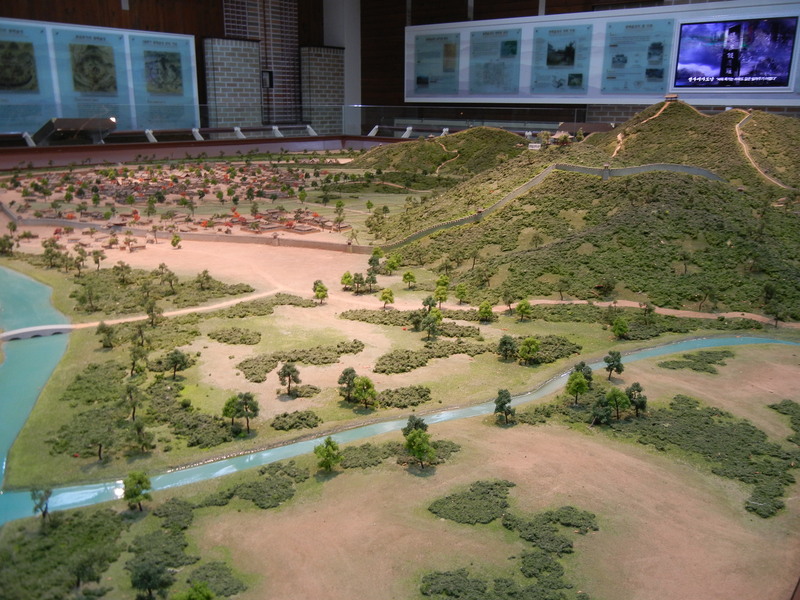 Currently, and until January 27th, there is an exhibition called Emperors in Istanbul at the Busan Museum. 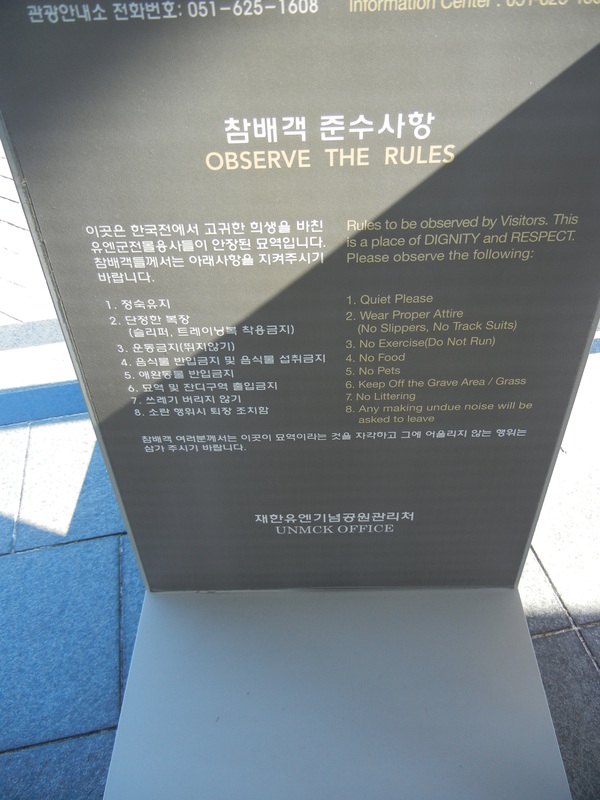 It costs 10,000KRW and you are not allowed to take photos. Usually when I’m told that I take them anyway–I paid, so, yeah–but the lighting was really dark so any photo would have come out bad unless I used a flash which would have been obvious and that picture would have probably come out looking flat. Anyway, whats in the exhibit you may ask? Coins and Medallions from all different rulers with their faces on them. Some amazing drawings of the different empires and attacks. A mirror with a handle that looks like a gold branch which I thought was pretty amazing. And a glass chess set–I don’t play chess but I’d be willing to learn if someone gave me a set as beautiful as that one. 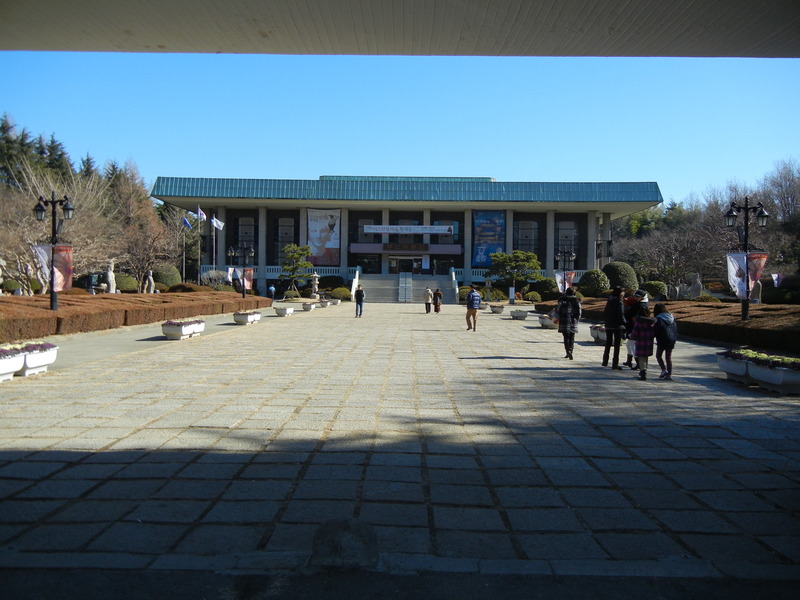 After the Istanbul exhibition, I went upstairs to the regular part of the Museum, which starts with History of Korea-Japan relations, which has never been good…Then was the Living Culture Gallery, the Folklore of Busan Gallery, Modern Busan, and Contemporary Busan. This is all in the second building. I never went upstairs in the first building because you are kind-of pushed from the front desk where you buy the ticket straight to the Istanbul part and I didn’t know there was anything upstairs (or that there even was an upstairs) in the first building. Oh well, maybe next time I go I won’t be told 3 times where to go because, apparently, stopping to look at something in a museum means you are lost (I wasn’t the security guard was just pushy). 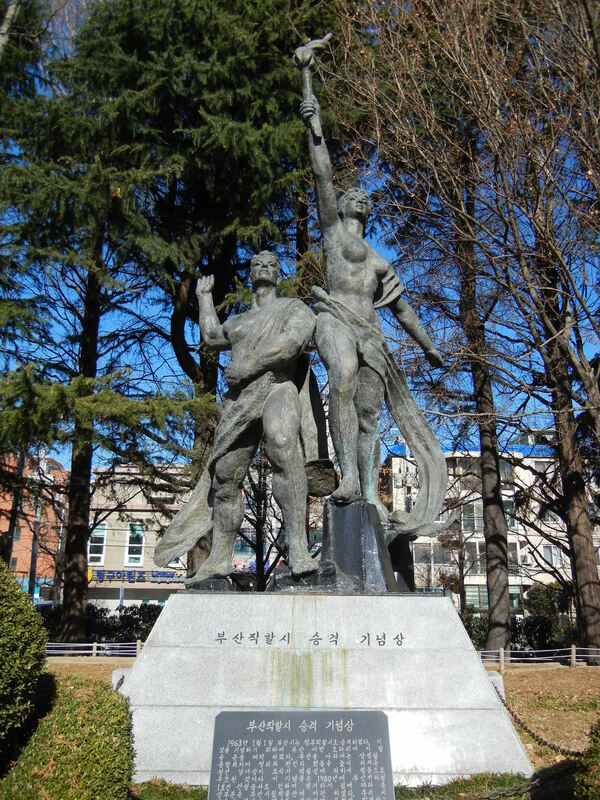 Here is the first part of History of Korea-Japan relations. 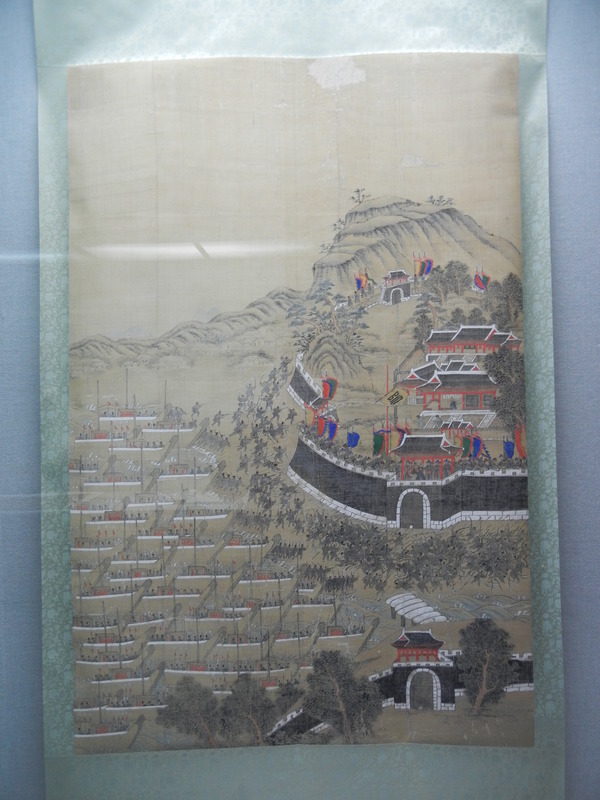 I loved the paintings of the time period, including the one below of an attack. I believe it was called ‘Defense of Busanjin somethingsomethingsomething’ because there were 2-3 paintings that started with the same ‘Defense of Busanjin’ part. 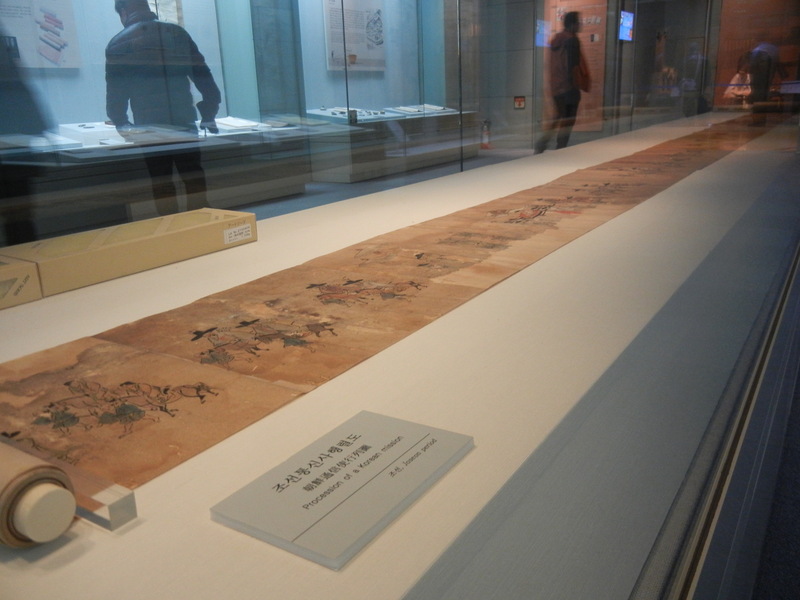 This last photo is a massive scroll, showing the Procession of a Korean Mission. 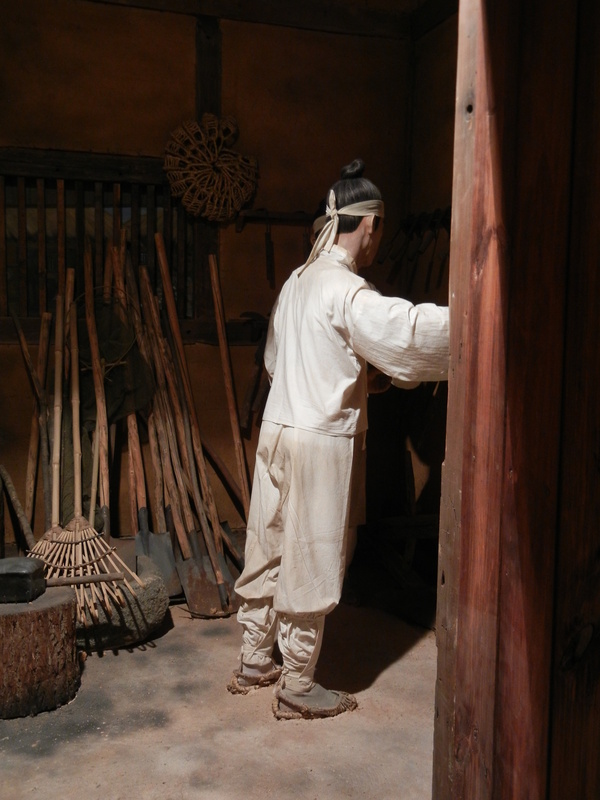 Next was Living Culture Gallery, which is small and had a warning sign of ‘This smell comes from Korean traditional straw thatched houses’. It did smell a bit odd in that room, but not odd enough for me to be bothered to ask someone downstairs at information about it, but I guess they had enough complaints. I always love this part of museums, because a lot of work goes into making them. The second photo I liked because of his shoes. 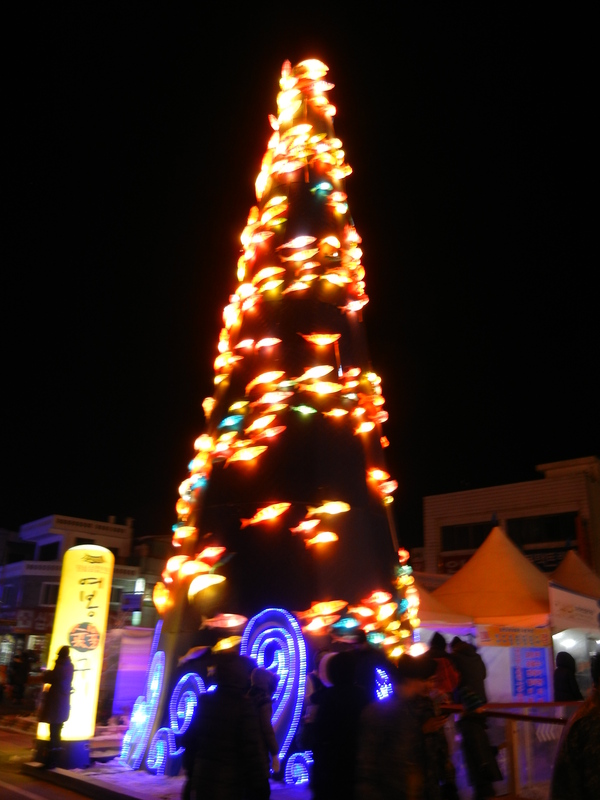 Folklore of Busan would have been more interesting if a kid did not change the video I was trying to watch. There were 9-16 videos you could put on in a large room, I put on 2 and sat down, and a kid ran up and started slamming all the buttons. Oh well. 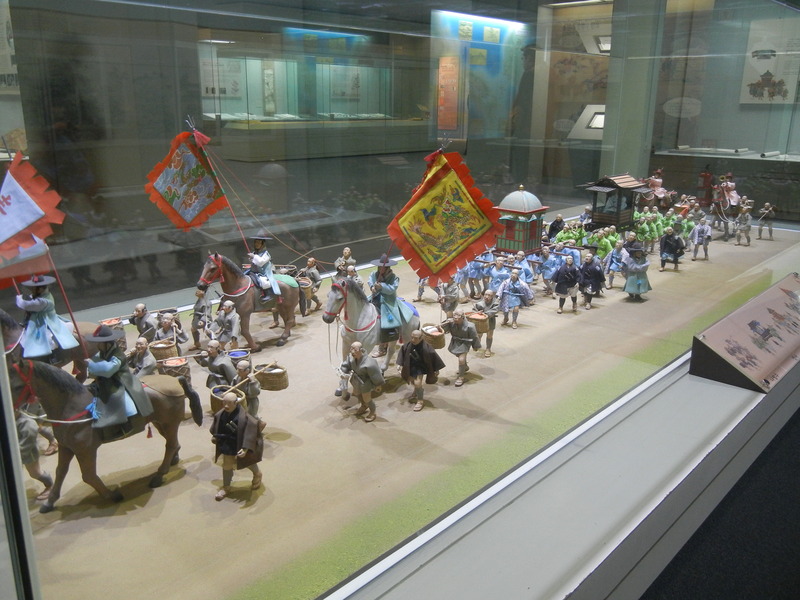 There were nice dioramas there as well. 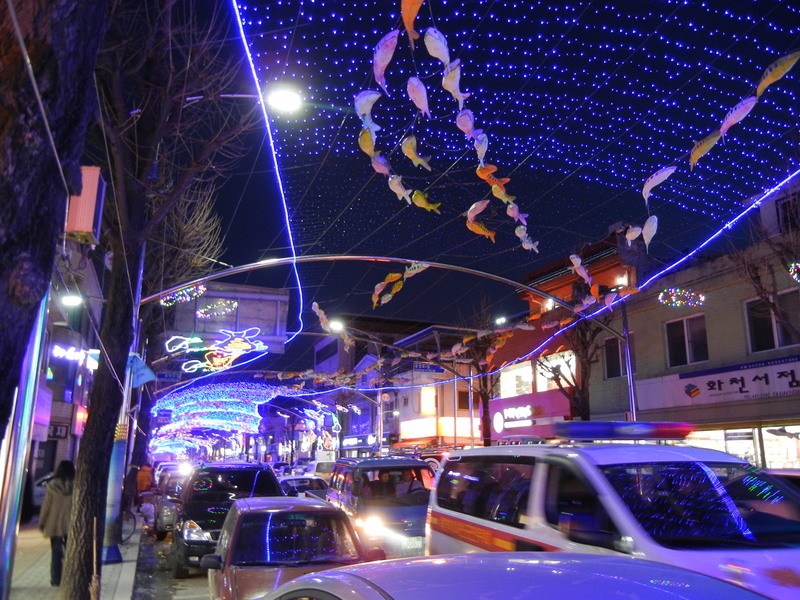 The next part was called Modern Busan, and mostly was about Busan during the Japanese Occupation. 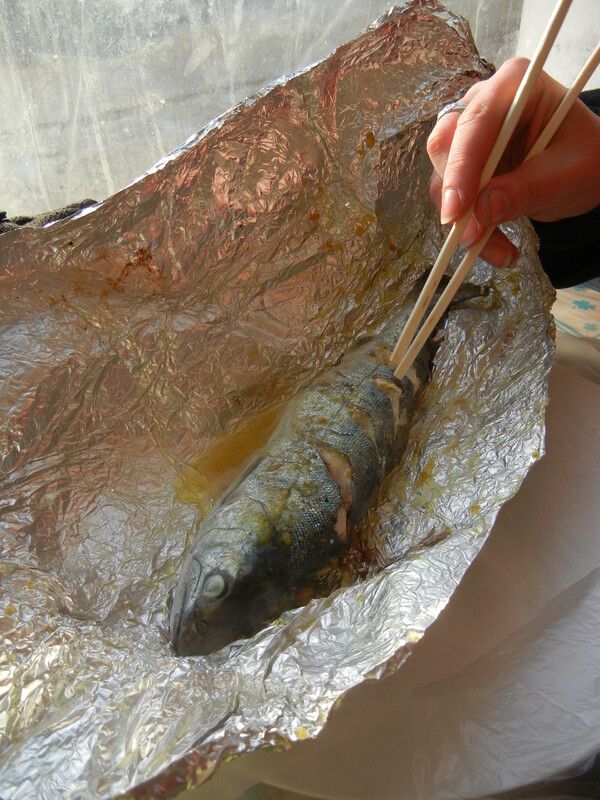 The picture explains why it is important to give up food for Japan. 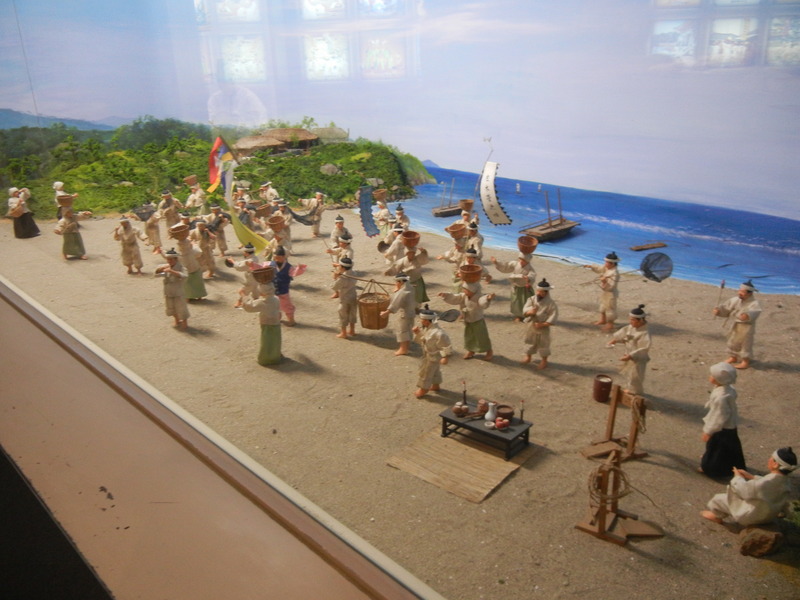 There was a video room titles ‘Education of Japanese Colonial Rule’, but since I did not understand what the video was saying, and the ‘teacher’ was just holding a stick while students looked sad it did not look to different from what my students tell me school is like now. 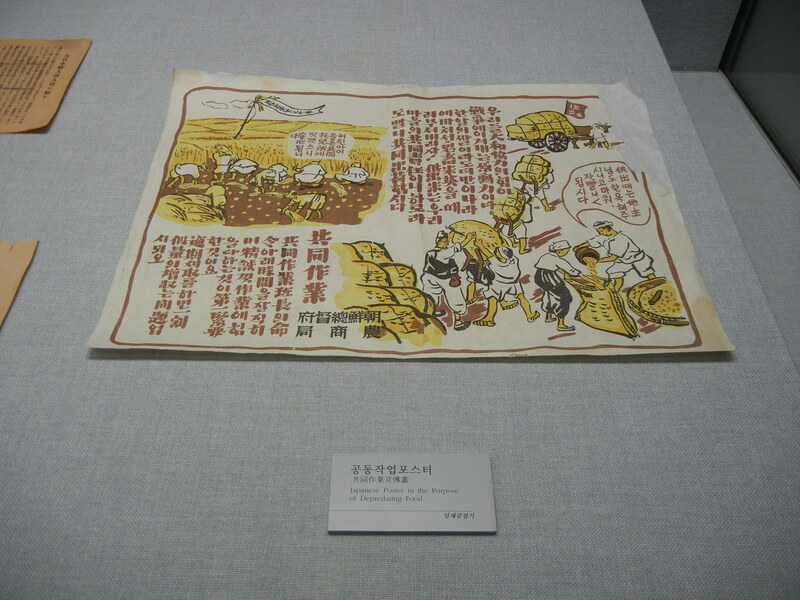 Meanwhile the photographs which had been thought to be made by attaching dried bodies on the paper, started to be popularized by degrees thanks to family photos for Koreans who give a high value on a familial solidarity. 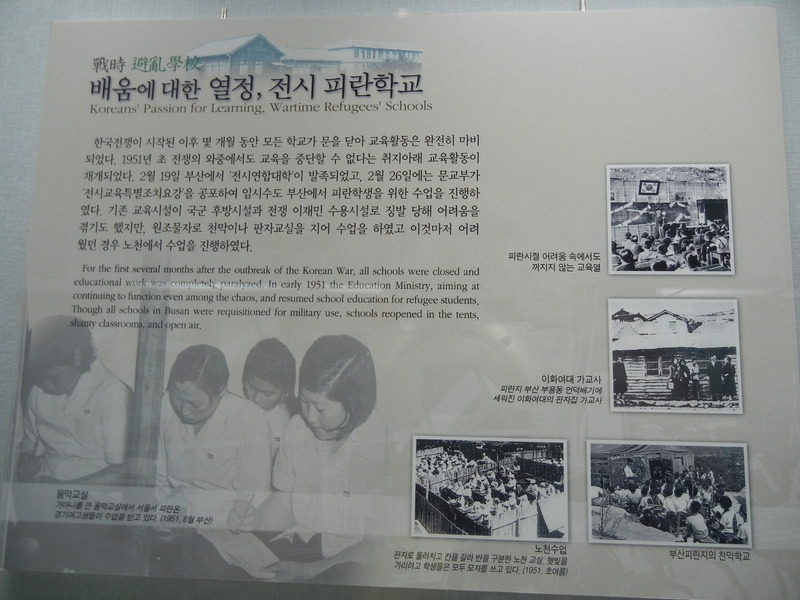 I thought this next photo was pretty interesting in what it says about school during the Korean war. After that is a photo of a sign saying that Korea should be united. 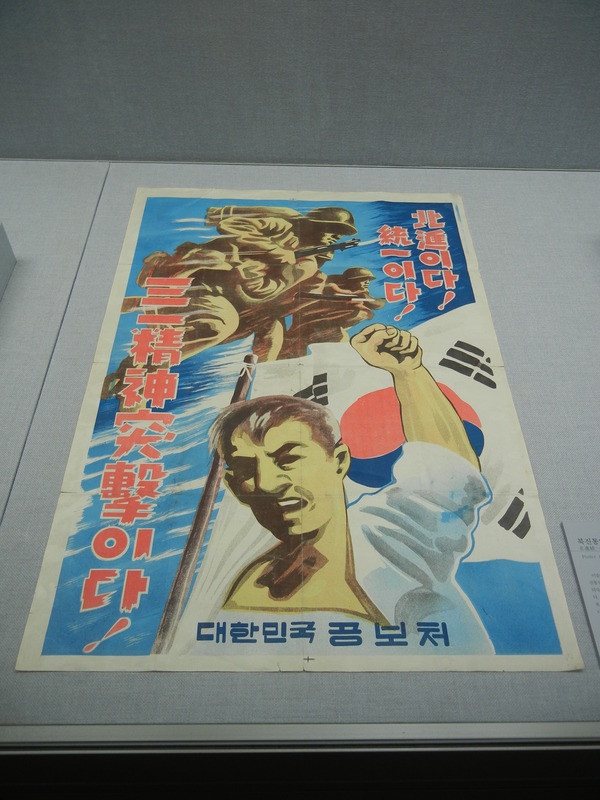 As Seoul was retaken on September 28, 1950, the Korean government felt it was the best chance to achieve the unification, so insisted on advancing northward. 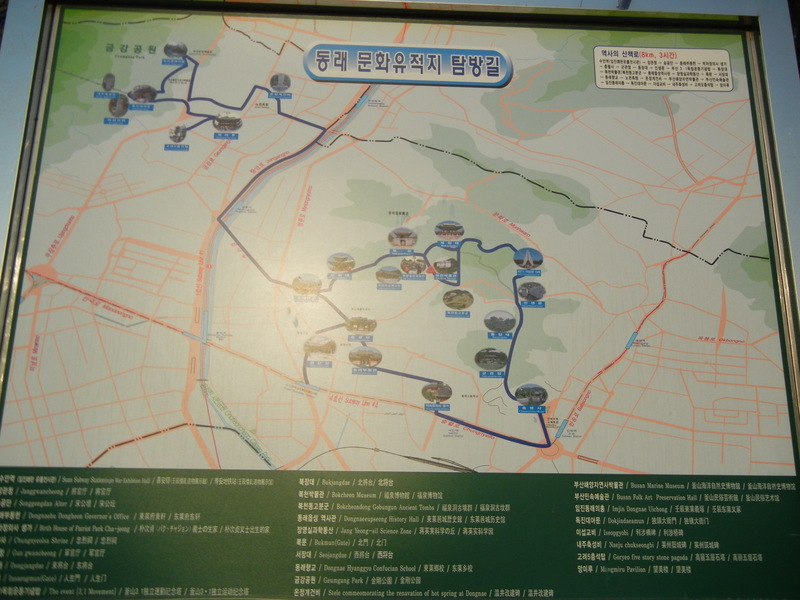 The UN and South Korean forces crossed the 28th parallel, took Pyeong-yang on October 19, and advanced northward to reach the vicinity of the Amnokgang (Yalu River). 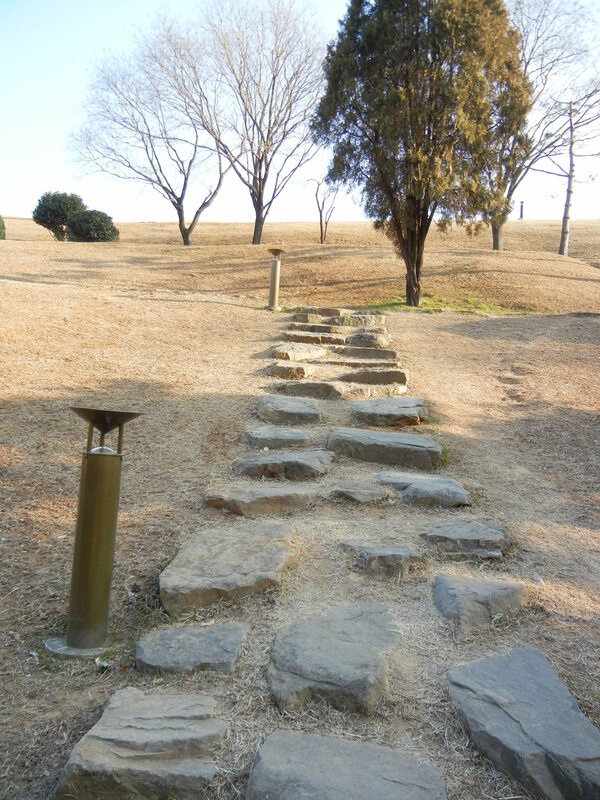 When the UN forces reached the Korean-Chinese border, the Chinese forces intervened in the war. Then the situation reversed and the UN forces retreated to the 38th parallel, around which the two opposing forces mingled with each other. I feel like this implies that if Korea had stopped short of the Chinese border then Korea would be unified. 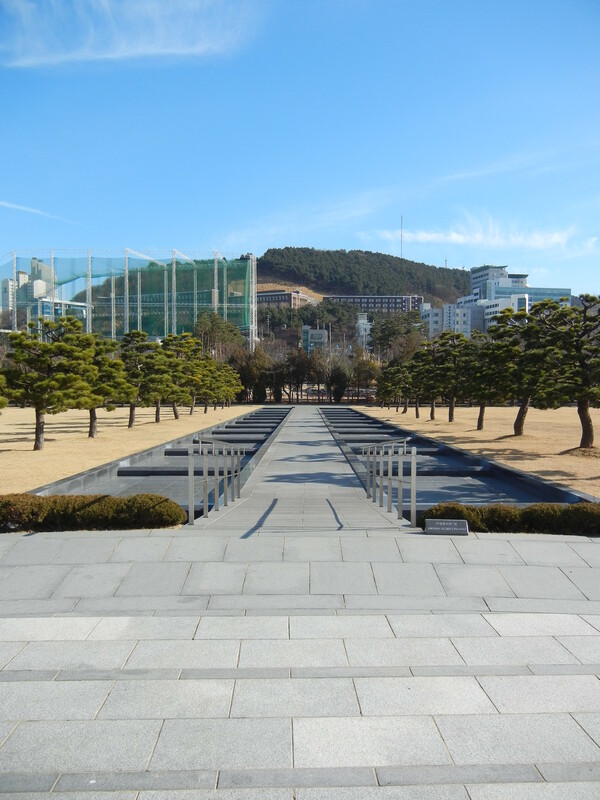 After this there was a sign calling the Korean War ‘The Unfinished War’, which sounds really accurate.